This is a chance to enjoy a visit to a Church which is redundant but also a Grade I listed building with an Anglo-Saxon tower, worth a visit even though you are likely to only see the outside as it is not usually open. You will be looking for something small but attractive nearby. I have lived in the area for nearly 40 years, and have regularly driven by the church and admired the Anglo-Saxon tower, which always used to look as if one or two of the massive stones were in danger of falling off. It's now been restored, and is a curious mix of styles, as the tower retains its ancient appearance, yet, if you ever get the chance to go inside, you will see that the chancel/apse is covered in brightly coloured ceramic tiles, giving it an appearance which has been likened to a Turkish bath. The church is in the very small hamlet of Waithe, just off the A16 between Louth and Grimsby. 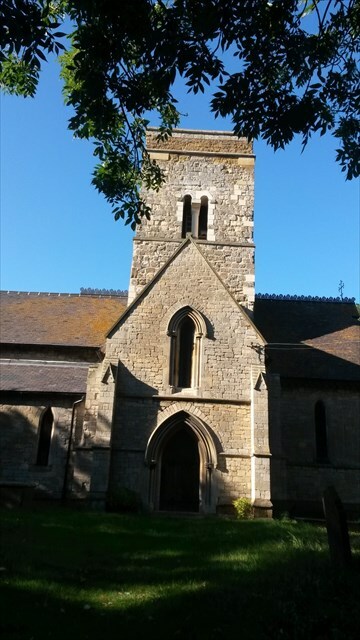 The most notable feature of the church is the Anglo-Saxon tower, which originates from the 10th century, with additions and alterations carried out in the 11th and 13th centuries. It was restored in 1861 in Early English style by James Fowler of Louth, for the Haigh family, local landowners. The church is constructed in local limestone and ironstone, with roofs of clay tiles and Welsh slate. Its plan consists of a two-bay nave with north and south aisles, a small south transept, a chancel in the form of an apse, and a central tower at the crossing between the nave and the chancel. The tower is in three stages with a plan parapet. The north wall contains a lancet window over which is a cinquefoil window. The bell openings in the top stage are paired; the lights being separated by a shaft with a cushion capital. The west wall of the church contains four lancet windows and a window in the shape of a vesica. In the north wall of the north aisle are two lancet windows, with a similar window in its east wall. There are five lancets around the apse of the chancel, and another in the east wall of the south transept. In the south wall of the transept is a doorway with a pointed moulded arch flanked by buttresses. In the gable above the doorway is a lancet window, also with a moulded head. In the south wall of the south aisle are two further lancet windows. By the beginning of this century the building was in a state of decay and had been vandalised, but repair work was carried out beginning in October 2005, costing nearly £350,000. Have a walk around and find the gravestone of Jane Alice. A = The first digit of the date in August when Jane died. B = The second digit of the year Jane died, minus the second digit of her age. C = The third digit of the year Jane died. D = The first digit of the year Jane was born. E = The last digit of the year Jane was born, minus the second digit of the year she died. F = The second digit of the day in August when Jane died.